Last Saturday marked a lot of firsts for me. It was my first time going to Quezon Memorial Circle. It was the first time I experienced sheer terror while crossing a street. It was the first time I attended a writing event that centered on food. With the amount of food love flooding the place, however, I sure hope it won’t be my last. 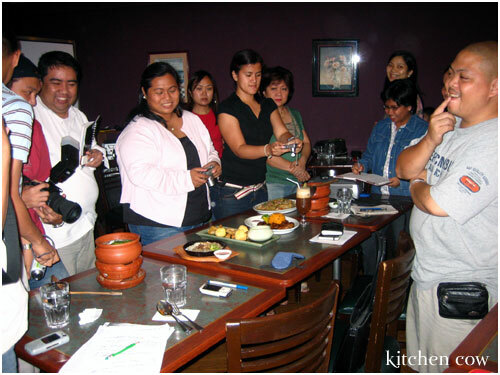 I’m referring to the First Blogger Food Writing and Photography Class held last Saturday, July 14 at Serye Restaurant. Organized by Jayvee Fernandez, it had a separate module on writing and photography, led by veteran magazine food writer Christine Nunag and seasoned digital photographer Markku Seguerra. Since it was announced that it was going to be held at Serye, I knew eating was going to be involved. Still, the amount of food they kept plying us with left me flabbergasted. After Christine’s lecture module, we were told to put blindfolds on. I figured this was going to be one of those blindfolded taste quizzes like the one they did on Top Chef Season 1 (Go Harold, Go!). My guess was partly correct. Instead of being made to taste ingredients though, they stuffed us silly with sampler sizes of various Serye dishes! Since I had never eaten at Serye before, it was quite an adventure for me. You know what they say? When you’re blindfolded, your other senses go on hyperdrive? Well, either my other senses are lazy, or I just have indiscriminate tastebuds! My learnings? 1. Kare-kare has no distinct taste on its own. I wouldn’t have identified it, if my second bite didn’t have a bit of bagoong with it. Well, either that or I just have very stoopid tastebuds. 2. I can identify Sisig from a mile away! One sniff of dish #1 and I was furiously scribbling on my notepad: Sisig. Serye’s sisig is quite good. Too bad it was a tad cold already, I imagine the crisp sisig bits melding with the chewy, gelatinous cartilage bits would’ve been fantastic served hot. The slight sourness provided by calamansi was perfect against the salty sisig. 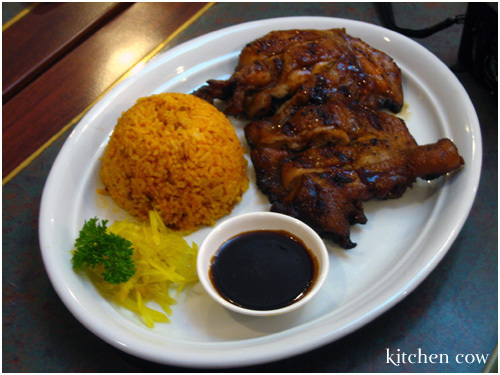 I don’t know if their recipe is naturally like that or if someone squeezed calamansi on my portion. 4. A marriage of Pinakbet (a vegetable medley) and Bicol Express (a spicy coconut-based dish) is one made in heaven! Serye’s homegrown Serye Express is a restaurant exclusive, so I was left stumped during the tasting. I could taste the spicy coconut-based Bicol Express style sauce. But I also bit into a squishy, fleshy slice of eggplant! If I have a reason to eat at Serye, this will be it. 5. I am unschooled in desserts. I had no idea what I was biting into, only that it was all yummy. The only thing I could vague identify was the last bite, a still warm serving of mini-Turon. 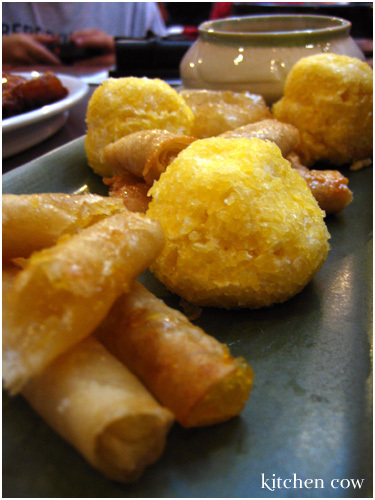 That one, I knew was traditional turon–saba bananas wrapped in spring roll wrapper then sugared and fried). But the other two bites, and the ensaymada, were mysteries to me. When we were finally allowed to look though, what we saw was a plate of beautiful dainties, mounds of crisp, golden mini-turons, little ensaymadas and a dish of tsokolate (native Spanish-style chocolate). Apparently, it was their Pinoy Fondue. How apt! 6. I know my noodles. I could tell bihon (thin glass noodles) and miki (local soba-like noodles) apart. Yay! I’m not a total loser. We tasted a total of 8 courses, ranging from soup (Sinigang na Tiyan ng Bangus / Milkfish belly in Tamarind soup), to entrees, to a drink (Serye Iced Tea). The tasting was a pleasant and interesting experience. I wanted to be right! So you can just imagine how excited we all were when we were finally allowed to remove our blindfolds. We had hyperactive food bloggers madly snapping pics! The exercise was truly an eye-opener for me. This made me realize how my vision and preconceived notions about how food tastes like affects my judgment. Not that it’s a bad thing, but this exercise made me more aware about truly tasting a dishes’ flavor. Will this reflect in my subsequent posts? I do hope so, but give me time to adjust. NEXT–PART 2: Hands-on Food Photography starring Serye dishes! This entry was posted in culinary events, food spotlight, restos & eateries, sponsored events and features. Bookmark the permalink. Hi! it was really nice meeting you last saturday! Buti ka pa you’re done na with your article. I’ve got this bad habit of procrastinating. eniwei, i love visiting your site and look forward to more bento posts! btw, pano na pala ung wordpress tutorial natin? hehe! Nice meeting you too! Hehe, I’m not yet done, I plan to write a part 2 with the photography session pa. And more food tasting, hehe. Nice to know you enjoy the site 😀 I have a bento post here, I just need time to write later, maybe over lunch. ako rin wala pang homework! bad betty, bad! haha! ganda ng picture mo with christine and the projector, very dramatic. you know what’s really strange? i remember the slide she’s showing, and i swear, maliwanag nung dinidiscuss nya yun! either super galing ka lang talaga mag dramatic photo effects, or that’s a really creepy picture, hahaha. Ala-chamba yan, hwehwehwe. I have a handful of pics with her and the projector, syempre I chose the madrama one, haha! Plus, I also remember this part too! It’s probably because we were all so busy squealing over the more exotic food items she mentioned. No deadline naman homework, hahaha! OMG! You cut your hair! Nyeh! I thought the person with the glasses and the denim jacket was yooooou! Hi, first time to visit your blog. 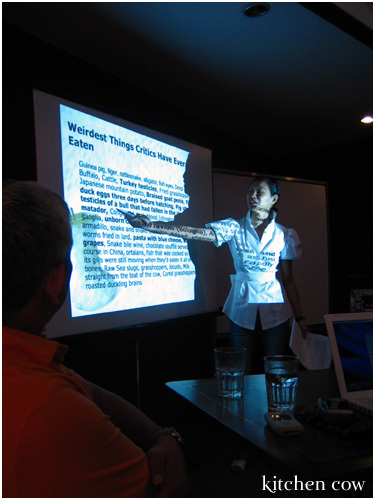 Is there a repeat of this food-tasting/blogging seminar? Hi socky! Unfortunately, I have no idea if they plan to do this more often. Still, Javyee’s original post identified the event as the first, so I’d think there would be more batches to come. I suggest visiting his site to find out of there’s going to be another one. Chrissie, it was nice meeting you at the workshop last week. Hey your photos turned out really great! The sense of smell is so powerful and thank God for it because it makes us appreciate good food so much more. However, there are dishes which smell awful but taste great nonetheless. Japanese food is my second favourite, next to Italian. Nice to meet you too 😀 But I bet I’ll be seeing you at more food events no?